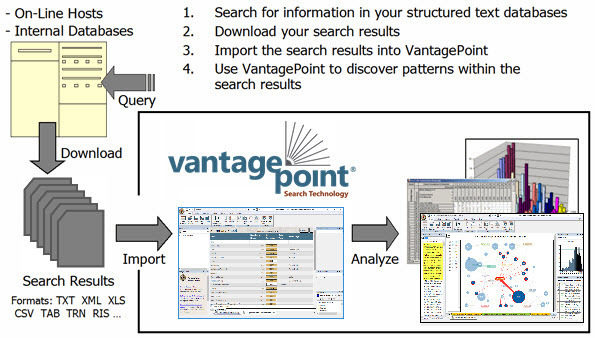 VantagePoint works with search results from text databases. First conduct a search using a search engine provided by your database provider. Then download the raw data to your computer, and import it into VantagePoint using an Import Filter. VantagePoint is most useful when your search strategy returns "more than you want to read." It can provide great benefit when working with only a few dozen records, but it is most helpful when you need to work with thousands of records. Importing – getting the raw data into VantagePoint and mining the raw data to get more data from it. Cleaning – transforming the data into a consistent set, combining the things that you want to analyze as a group, and merging and normalizing data from diverse sources. The menu at the top-right of this page lists just a few of VantagePoint’s major features. Browse these pages to get an overview of how VantagePoint can help you get good answers quickly. Entities defined in user-managed dictionaries. For this import process, VantagePoint uses Import Filters, which can be specifically tailored for each database, database provider, and your particular requirements. Our Import Engine is a powerful tool for leveraging the value that is hidden in your data. Our on-line library contains more than 180 Import Filters covering a large proportion of the patent, business, science, and technology databases; and it is freely available to our customers. Our support team can create and customize Import Filters to your requirements. VantagePoint comes with all of the tools you need to do-it-yourself. Top 10 Lists: You can browse your data from many perspectives. The simplest tool is a list. Using a list of affiliations (or authors or countries), you can see the top affiliations (or authors or countries) and browse the records for each one. You can sort and search your lists in an instant, and create groups in your lists in many different ways. List Comparison lets you compare any two lists from any set of VantagePoint data and identify the common or unique items in the lists. With time-sliced data sets, this can help you identify new or emerging concepts, authors, institutions, or countries. Using Group using Thesaurus, you can apply a thesaurus to your list and create groups of list items. Find and Group searches the list for your target text and adds matching items to a group. Find provides for three search strings and several Boolean operators (for example, "and," "adjacent," "near4," "or", etc.). … and no, you are not limited to viewing 10 at a time. Co-occurrence Matrices: Using a Co-occurrence matrix, you can spread a list across any other list. For example, using a co-occurrence matrix of "author" and "year of publication," you can see an author's publication trend over time and browse their publications by year. This way, you can see which authors have been working in an area for the longest time as well as whether they are still active. Data from lists and co-occurrence matrices can be easily exported to other applications for visualization or customized analysis. This example shows a three-dimensional column chart created using VantagePoint data in Microsoft Excel—simply select a portion of the co-occurrence matrix, copy it to the Clipboard, and paste into Excel. This example is created from a co-occurrence matrix of publication source-by-year. It shows the relative publication trends in the different research communities. The "research communities" are created in a list—Group using Thesaurus—and the co-occurrence matrix is created using the groups. These data are also exported directly from VantagePoint and plotted in Microsoft Excel. Maps/Networks: Beyond one-dimensional (Lists) and two-dimensional (Co-occurrence matrices) analyses, VantagePoint performs multidimensional statistical analysis to identify clusters and relationships among concepts, people, organizations, and countries. This example shows an Auto-Correlation Map. Each node represents one person (in this example, inventors associated with a particular organization in a patent dataset). Proximity of people and links between people show the strength of relationship (correlation) based on co-occurrence of their names in the same records (e.g., patents). Some "teams" can be readily seen and one individual that is related to everyone else. 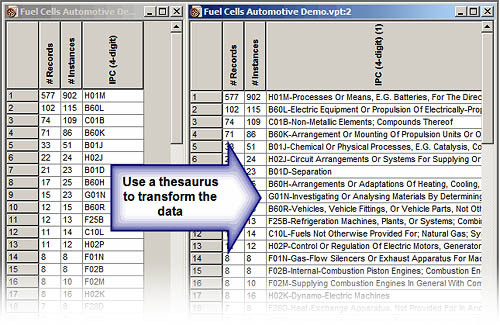 This example shows a factor map of Descriptors (index terms) in a dataset. Each node may represent several descriptors that are combined based on how frequently they occur together. Proximity and links show higher correlation among terms. From the map the user can browse the underlying text for each node. Data Cleaning: VantagePoint uses fuzzy matching techniques to identify, associate, and clean up data. For example, it will handle misspellings, alternative hyphenation and capitalization, and differing conventions for listing the names of people and companies, providing you with higher-quality data that is essential for good analysis. The data cleaning tools can be applied to any field, and VantagePoint can automatically "check" the fuzzy matches by looking at a complementary field—for example when matching inventor names, also requiring the assignee to match. After VantagePoint's automatic cleanup, the Cleanup Confirm window gives you a powerful toolset and full control of the results. The Detail Windows let you interactively validate the cleanup suggestions. User Managed Thesauri: With VantagePoint you can create, edit, and apply thesauri, which can be used for specialized data reduction or conversion. Using a thesaurus, you can easily combine all variants of a data element (for example, United States, US, U.S., USA, etc.). For other types of analysis, you can combine data elements into broad categories (for example, "aluminum alloys," "magnesium alloys," "carbon fiber reinforced plastics," and "copper alloys" into "Materials"; or "USA," "Canada," and "Mexico" into "North America"). You can also use a thesaurus to transform classification codes or index terms into something more easily understood. 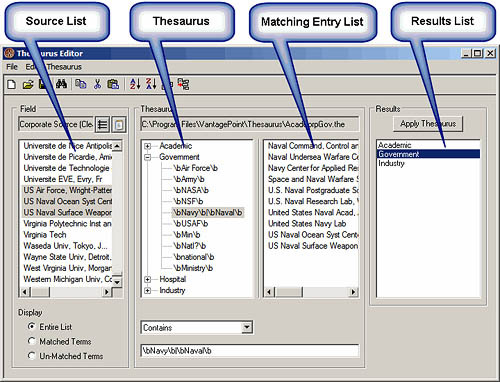 VantagePoint's Thesaurus Editor provides several interactive tools for creating, editing, testing, and managing your thesauri. VantagePoint's thesauri support both normal text and Regular Expressions for matching data in the source list. Scripting: You can automate sequences of actions using VantagePoint's extensions to Microsoft's VBScript. Create and distribute scripts and make your customized analysis techniques and processes easily repeatable. VantagePoint adds eight VB objects and over 200 VB methods to VBScript. Operating Systems - VantagePoint works on Windows 7, 8, and 10 platforms. VantagePoint has a 32-bit version and a 64-bit version. The 64-bit version of VantagePoint requires the 64-bit version of Windows. Installation on Windows Server is not supported. Other operating systems (e.g., Macintosh OS X or Linux) are not supported. While not a requirement for running VantagePoint, some of our Visual Basic scripts require Microsoft Excel (2003 or later). Processor - Intel i3 or better, or similar non-mobile processors. The faster the processor, the better the performance. VantagePoint will use multi-core processors to improve performance of many operations. Memory - The minimum recommended operating RAM is 4 GB. With 64-bit VantagePoint, a minimum of 8 GB is recommended. The available physical RAM has the biggest impact on VantagePoint performance. VantagePoint files can be quite large and it is much easier to work with them if they can be loaded into RAM. If the operating system has to use Virtual Memory to load a file into VantagePoint, performance will be slower. On a 32-bit Windows Operating System, the 32-bit version of VantagePoint can use up to 2GB of RAM. On a 64-bit Windows Operating System, 32-bit VantagePoint can use up to 4GB of RAM. The 64-bit version of VantagePoint can use much more RAM. The exact amount depends on the specific version of the Operating System. For most professional versions of Windows, 64-bit VantagePoint can use at least 128GB of RAM. Some versions of Windows allow much more. Disk Space - VantagePoint itself uses about 700MB of disk space. This does not include the disk space needed for your data files, which can be quite large - typically no less than 5MB/1000 records. Display - Graphical and tabular outputs of VantagePoint require a minimum of 1024 x 768 screen resolution. Data - In addition, VantagePoint requires that you have access to sources of bibliographic data and database definition files for these data sources. Database definition files are available for many popular databases and custom definition files can be coded for virtually any structured text database. Licensing: VantagePoint is licensed on a per-seat basis. The commercial version is offered as a 12-month Term License. 12 months of downloadable upgrades. The upgrades are available through the VantagePoint web site. 12 months of technical support. VantagePoint Reader - enables colleagues to view datasets and sheets that have been created in VantagePoint (for example lists, maps, matrices, profiles, and charts). VP Reader is freely distributable within your organization. Pricing: If you would like information on pricing, volume discounts, or academic licensing, please contact us.